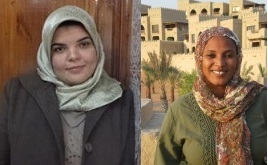 They are Sudanese writer and activist Rania Mamoun and Moroccan poet and novelist Soukaina Habiballah. The other grantees are working in the fields of music, theatre, film, video and visual arts. Mamoun won a grant — which can be up to $6000 — to write a novel titled Azeeb, while Habiballah’s was to write Why Must Zubeida Commit Suicide?, a book reportedly about the suicide of a small-town mother living in northern Morocco. Mamoun was born in east-central Sudan in 1979, and has worked both in print and in broadcast journalism. She’s published a book of short stories, The Thirteen Months of Sunrise (2009) and a novel, A Wild Plant (2006). Mamoun also received an Arab Fund for Arts and Culture (AFAC) grant in 2009 and was selected to participate in the 2010 International Prize for Arabic Fiction nadwa, an annual writing workshop. But Mamoun is perhaps better-known as an activist who was arrested in September 2013 and put on trial for “inciting riots.” In December 2013, she was convicted of causing a disturbance during protests sparked by rising fuel prices. According to AFP, she was ordered to pay 500 pounds, about $65, or spend a month in jail. Habiballah also won an AFAC grant for the organization’s novel-writing program and published a poetry collection in 2014. A total of 130 projects were submitted for this round of awards. According to Ahram Online, the final selection brings the total of supported projects by Al-Mawred to 177 since the inception of the programme in 2004. This year, the literature jury was made up of prominent literary artists: Syrian author Khaled Khalifa, Moroccan poet Yassin Adnan, and Algerian novelist Bachir Mefti. LA BOURSE D’AFAC OU PLUTOT LE PROGRAMME D’ECRITURE D’AFAC N’EST AUTRE QUE CELUI DE MON MOHTARAF QUI A SIGNE UN PARTENATRIAT AVEC AFAC QUI NEGLIGE LA PLUPART DU TEMPS DE LE MENTIONNER.